Ten double sided cards each have a different single digit printed on each side. When the cards are arranged in a row a pandigital square, P, is formed. When the cards are turned over and kept in the same order the result is a different pandigital square Q. In the clues the subscripts refer to the cards in positions 1 to 10 respectively. For example if P was 6154873209 then P25 would be the four digit string 1548. In order for solvers to identify P and Q, the grid, which has 180° rotational symmetry, should be completed. In the grid no entry starts with zero and all are different. P and Q should be written underneath the grid. 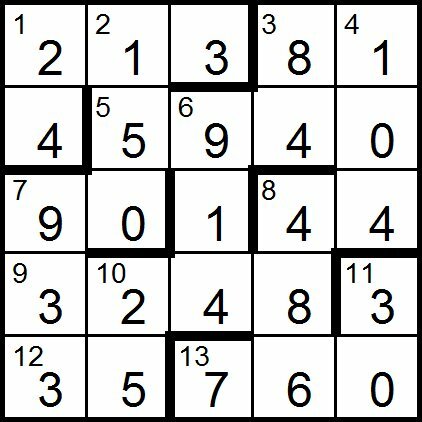 From the clue lengths and numbering we can deduce the grid to be as follows. 10d. Q4 is 5 or 6 so Q34 is 25 or 36. So 5a starts with a 5 or 6. The only fit is with 150 so Q10 is 6 and Q34 is 25. Entering these in the grid gives up P4 as 2. So we have P as ???2?????? and Q as **25*****6. 8a. Q12 > P12. So Q1 is not 1. 3a. P10 is 4, 5, 6 or 9. But from 8a it is not 4 and from the fact that P4 is 2 it is not 5. So P10 is 6 or 9. If it is 6 then Q12 is 36 but Q10 is 6 so P10 is 9 and 3a is 81. Q1 is 8 and Q2 is 1. Using the 2 digit termini of square numbers tells us that P9 is even but not 2 which already appears in P. Also Q9 is odd and will be 3, 7 or 9. 8d. 6 x 81 = 486 so P6 is 8 and P8 is 6. 12a. P2 or P5 must be 5. 11d. 1 must be in P1 to P4 inclusive. 3d. This is a multiple of 12 so must be 84 and Q8 is 7. 7d. Starts with at least a 4 so 7a must be 90. Therefore Q5 is 9, Q9 is 3 and Q7 is 0. Thus Q is 8125940736 which is 901442. 6d ends in 4 so P5 is 4. Now P9 is 0. 11d. P2 must be 5. 4d is a multiple of 8 and is 104 so P7 is 7. 1d is 24 so P3 is 3 and P1 is 1. P is thus 1532487609 which is 391472. 7d is 933, 9a is 3248, 1a is 213 and 6d is 914 which check out. 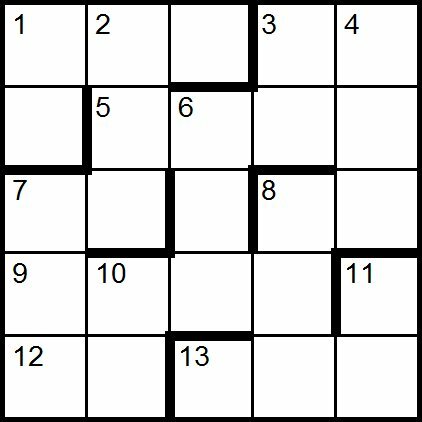 In a first for Listen With Others, the following is a puzzle by Oyler that was sent to all solvers who submitted feedback with their solution to the puzzle. Many thanks to Oyler for allowing this to be published here, and I hope that people have as much fun solving it as I did. If anybody has any feedback on this puzzle, then I will happily pass it on to Oyler, or it can be posted as comments at the bottom of this posting. In the clues P, Q and R are a two digit, three digit and four digit number respectively that between them contain all of the digits from 1 to 9 with P prime such that PQR = X_Y_Z where X_Y_Z is a nine digit number split into three groups of three digits that again contains all of the digits from 1 to 9. For example 29 x 871 x 5364 = 135,489,276. Across entries are in capitals and X¢ denotes the reverse of X. 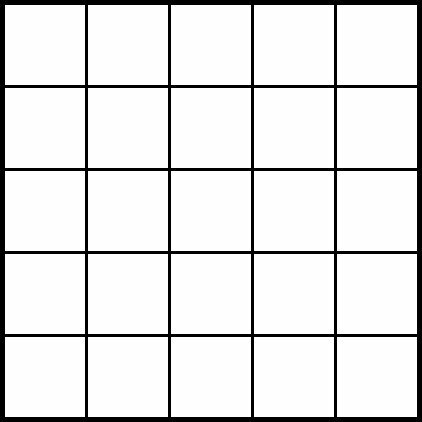 All the entries are different, the normal rules of algebra apply and there are no zeros in the grid.